Three rights are to be enshrined in a new constitution, according to the proposals for key features of a constitution published by the United National Party Government. “Right to education” tops the list followed by “right to culture, religion and language and “right to good administration”. Barring the issue whether these rights should be constitutionalised or not, I am delighted that the right to education is accompanied by the right to a good administration. As I wrote sometime back in the Law and Society Trust Journal, a right to education is meaningless without the accountability of administrators in the education sector. All political parties more or less agree on the objectives of a general education. 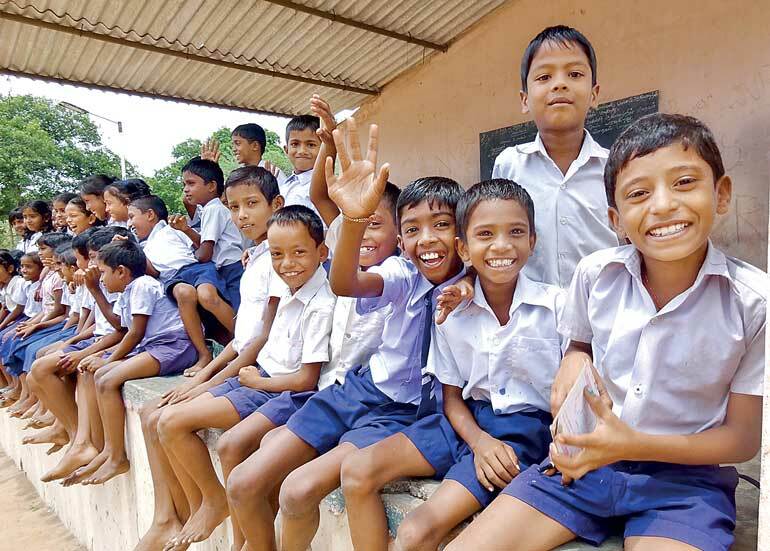 They want a more equitable distribution of resources across schools and a holistic approach education that replaces the current examination-centred system. Proposed solutions too are similar. Increase expenditure, remove political controls, bring in a new education Act, limit class size, and bring international schools to the national policy framework and so on. Unfortunately, past attempts at reforms along same lines whether called Navodya, Isuru or Mahindodaya schools have achieved little. As I argue in this article, ‘genuine devolution’ of education administration to provinces within an environment where provinces are incentivised to innovate in competition with each other could be a game-changer in education reforms. I borrowed the term ‘genuine devolution’ straight from the UNP’s proposals for a new Constitution. Lack of coordination within the ministry and the agencies coming under the purview of the ministry and between the ministry and provincial authorities. Unfortunately, the drafters of the NEC report side-stepped own analysis and presented their recommendations as if there are efficient, effective and motivated officials who would coordinate activities to deliver an efficient and effective education system and all politicians are going to act as responsible stewards of the public good and public trust. In fact, the 2003 recommendations, or those that followed in 2008, while laudable, fall to respond to NEC’s own analysis of dysfunctionality of the system of education administration in Sri Lanka. In fact, all education initiatives are designed and implemented without acknowledging this dysfunctionality. In my experience working with schools in remote locations, the 13th Amendment as applied to education makes eminent sense. The 13th Amendment recognises indirectly the Ministry of Education as responsible for national policy, and three other national bodies operating under the jurisdiction of Ministry – i.e. Department of Examination, National Institute of Education and National Library Services Board, respectively –responsible national examinations, curricula and teacher training and national policy regarding libraries, respectively. Further, the 13th Amendment makes it clear that all matters concerning all schools in a Province other than specified schools – i.e. National schools, Special schools for service personnel and schools for specified development schemes – is the responsibility of the Provincial Councils. One exception is the Appointment of Principals to 1A, 1B, 1C category schools which will the responsibility of the Secretary to the Ministry of the Minister in charge of the subject of Education or the Public Service Commission. The decentralised system for education as intended by 13th Amendment is a policy planners dream. With nine provinces competing for education allocation, the line Ministry could set national policy, establish performance standards and use carrots and sticks to encourage provinces to innovate and deliver the best possible education in their respective localities. Essentially, the MOE could be like the conductor in an orchestra of nine, wielding its monitoring and evaluation (M&E) baton deftly. Unfortunately, the current mode of operation at the Ministry of Education does not differ significantly from the command and control approach of previous regimes where ministry officials use the long arm of an extended hierarchy of provincial officials to zonal officials to divisional officials to direct principals and teachers to do deliver education. The Ministry of Education at the national level (MOE) has 56 divisions organised under the five categories – Administration, Audit, Education services, Finance, Policy and planning, Quality and School supplies. Administration at the provincial level is further divided into 90 zonal offices with about two to three divisions per each zone and each with its own administrative structure. The total number employed by this administrative structure, national and provincial, is something that should be available, but, is not. The total number of schools which are administered by the provinces numbers 9000 or more. During the last five years from 2010-2014, the MOE sent 67 circulars, if we count the circulars listed on the MOE website. Of the 67, seven were on admission of students, 30 on inter-provincial competitions, six on ICT in schools, five on special programs like Vesak celebrations or donor-funded initiatives like the ‘child friendly schools,’ eight on syllabi and examination issues and 11 on school timetable. The Vesak celebration circular is symptomatic of the problem. It outlines in detail activities for each of the five days of the Vesak week, leaving little room for new ideas from schools. The addressee list of all circulars sent by the Secretary of the MOE goes as ‘To All provincial secretaries of education, All provincial directors of education, All zonal directors of education, All divisional directors of education and All principals’. This micro-management-by-circular method of the MOE has to be viewed in the context of power they wield and complexity they add to a school system already working under restrictions. In my experience, the long arm of MOE takes away any inclination for initiative at the Provincial level, turning the provincial officials into paper-pushers, who wait for the Centre tell them what to do. The Appropriation bill for 2016 has been tabled in Parliament. 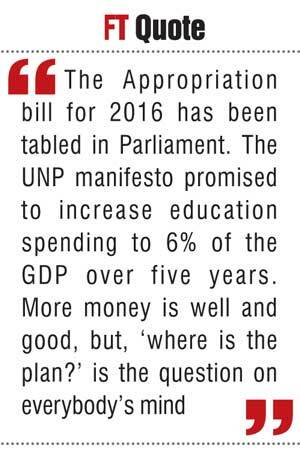 The UNP manifesto promised to increase education spending to 6% of the GDP over five years. More money is well and good, but, ‘where is the plan?’ is the question on everybody’s mind. The details would be revealed during the Parliamentary debate, but let us look at the past 2015 Budget estimates for now. The 2015 Appropriation Bill allocated Rs. 44.3 billion for the Ministry of Education. From the 2015 Treasury budget estimates, we learn that an additional 98 billion was allocated for ‘Activities implemented by Provincial Councils and Other ministries on general Education’. For 2016, the amount allocated to the MOE is increased to Rs. 181 billion. The amounts allocated for activities implemented by Provincial councils will not go up significantly because allocation for the ministry for Provincial councils and Local Government has not increased significantly. Just how the Ministry plans to spend the money is the billion rupee question. If it is more of the command and control approach where attempts are made to change the behaviour of teachers and principals through the long arm of a bureaucratic hierarchy from ministry to province to zone to division, I would worry. The ‘Nearest school is the best school’ slogan adopted by the Ministry captures the essence of the solution we need in education today. However, the Ministry should learn from past initiatives and realise that the Yahapalana mantra is not sufficient. We need a totally new approach, encompassing a genuine devolution of administration as stipulated in the 13th Amendment or other out of the box thinking. The intense competition to get into 100 or fewer popular school is the best indicator of the troubles in our education system. Understanding this, previous regimes used money from same donor sources, but under different names. The Secondary Education Modernisation Project (SEMP), Navodya Schools, Isuru Schools and the more recent 1,000 schools with Mahindodaya Labs are examples. It is interesting to follow the annual Performance Reports (APR) of the MOE of 2010 and 2013 see the expectations then. The provincial administration is often blamed for the failure of these projects, but, the problem is lies in command and control approach of MOE, I believe. The solution is to empower the provinces and then challenge them to deliver.